Recently I was contacted by LeapFrog and was told about their exciting new program called Tag. Give. Read! The giving program is to get Tag learn-to-read systems to the teachers and children who need them most. LeapFrog has donated $100,000 to DonorsChoose.org, to match funds for teachers who want Tag Readers for their classrooms. Because of this great program, I was given the opportunity to help out a local teacher of my choice. Their class will receive a Tag classroom “kit” consisting of 3 Tag School Readers and headphones, plus 3 copies each of 15 different Tag books(45 books). I selected to help out Ms. Bridges who teaches at a small local school that my boys have attended. I selected her because as a parent you "just know" when someone cares about your child's education and seems to go above and beyond for you and your child. She is a teacher that I feel makes a difference in her students lives even if she does not realize she is doing it. Hopefully, these Tag School Readers will help her students reach and go beyond their reading goals they have set. The class should be receiveing their "KITS" as soon as newt week, stay tuned to my blog for an update from Ms. Bridges and her class on what they think about the Tag Readers. What is Tag Reading System? 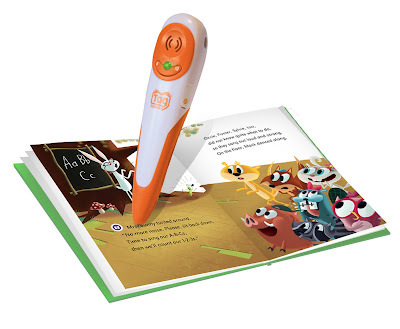 The Tag Reader is a hand held, learn-to-read tool for children from Pre-Kindergarten to third grade. When children touch the Tag Reader to specially printed materials, they can get on-demand pronunciation for individual words, listen to audio from characters and story elements and play activities that reinforce key skills such as comprehension and vocabulary development. By providing matching funds through DonorsChoose.org, LeapFrog is doubling the gifts of anyone who wants to “give the gift of reading” to teachers requesting Tag systems. Those who wish to give can visit the Tag. Give. Read page at LeapFrog.com. All DonorsChoose.org projects that are eligible for the LeapFrog match are searchable by teacher name or geographic area. Once a teacher’s goal for Tag Readers is half-met by donors, LeapFrog provides the rest. Every donor will see their gift in action, through photos of the students, along with thank-you notes and a cost report showing how their dollars were spent. * As of today, there are 181 “projects” listed that qualify for the LeapFrog matching funds program. Once these 181 teachers’ requests for Tag Readers and books have been half-funded—by readers like YOU , even $1 per reader can help!—LeapFrog pays the other half, until their entire $100,000 donation has been spent. One reader will WIN the following . . .
Tag Reading System + US Map and 2 additional books for use at home! YOU Will ALSO select a Kindergarten teacher of your choice to receive a Tag “kit” for classroom use, consisting of 2 Tag School Readers and headphones, plus 2 copies each of 15 Tag books. Winner Has Been Emailed ! Enter by doing any of the following. You can do as many of these as you like. MANDATORY: Please leave a valid email address in each comment ! One winner will be chosen ! I will be using a random number generator to select the winner. Contest ends at 11:59pm CST on October 31, 2010. If the prize is not claimed in 48 hours a new winner will be chosen.Contest open to U.S. residents only.The winner will be emailed. Thank you to LeapFrog for donating a Tag Classroom Kit to the classroom of my choice and also for providing the prize for this giveaway. I would like to win this for my niece and my daughter's school. This is great for my next door neighbor's daughter who is 5 years old. She loves to pretend that she is reading and with this, she could really get into reading!! I follow via Google Friends! I liked Leapfrog on facebook-entry #1. I liked Leapfrog on facebook-entry #2. I liked Leapfrog on facebook-entry #3. Shared information about the Tag. Give. Read. program with my daughter verbally an showed her the site she was planning to enter too for her sons kindergarden teacher! I'd like to help a classroom in Chicago I helped earlier this year. I follow via Google Connect, thanks! I'm also following you on Twitter @ molomatic, thanks! October 20, 2010 at 11:51 AM This comment has been removed by the author.